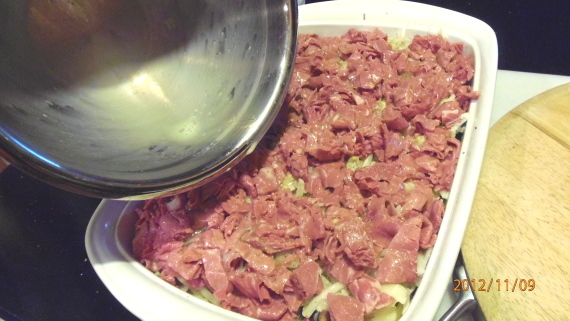 This is one of those “assemble the day before” casseroles. 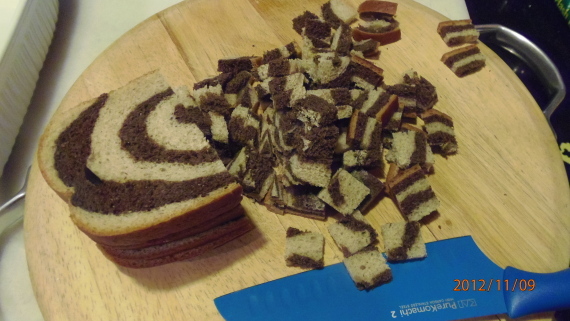 What I love about them is they’re perfect for entertaining a crowd or a large family with basically no muss, no fuss. 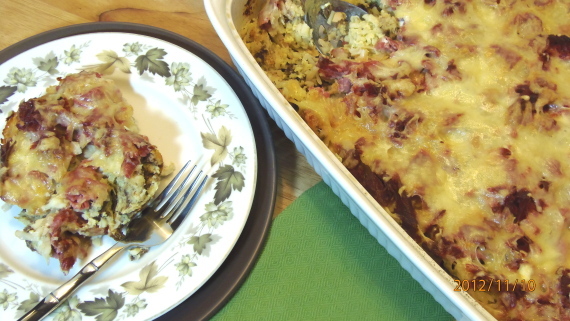 With little prep time, this casserole is a time saver for busy families for week night dinners, or even weekend entertaining. 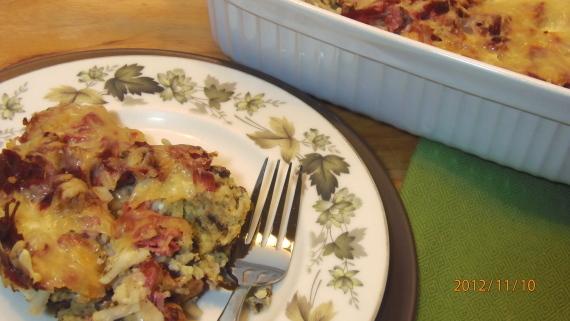 I embellished a recipe I found out of Taste Of Home magazine and came up with what I’m calling the Corned Beef Hash Strata. 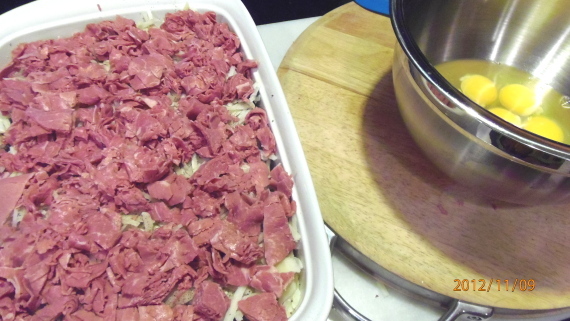 -In a large 13×9 baking dish, evenly layer the cubed bread, hash browns, chopped corned beef. 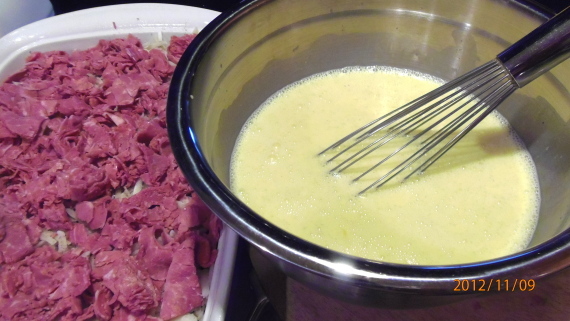 -In a large bowl, beat the eggs, milk, mustard, salt and pepper. 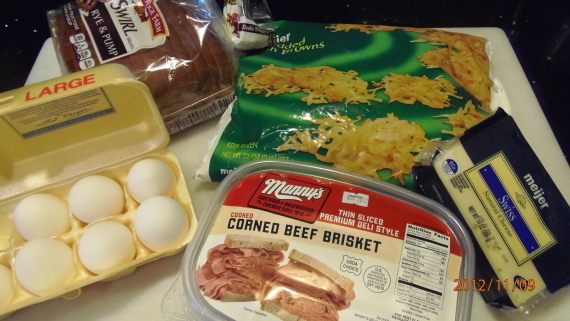 -Pour the egg mixture evenly over the corned beef and hash browns in the baking dish. 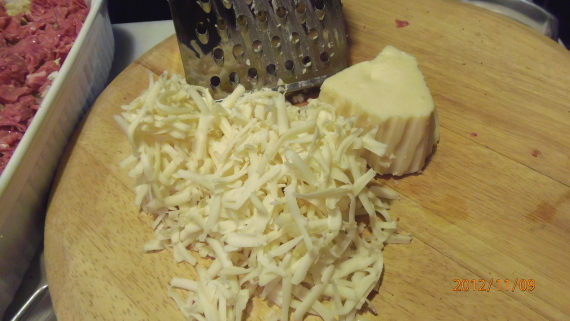 -Top evenly with the shredded Swiss Cheese. 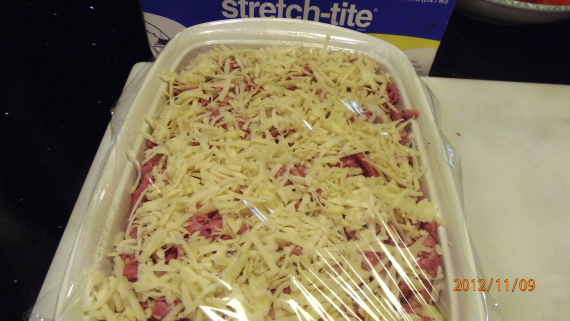 -Cover and refrigerate at least 6-7 hours but preferably overnight. 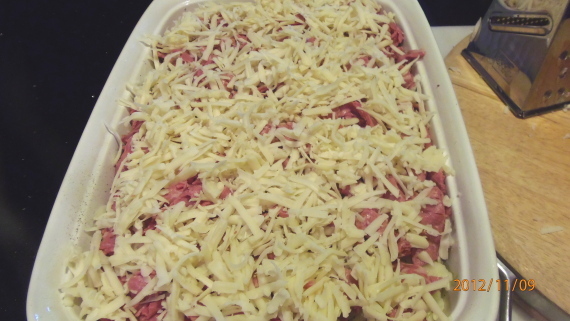 -30 minutes before baking, remove the strata from the fridge and allow it to slightly come to room temperature before baking. 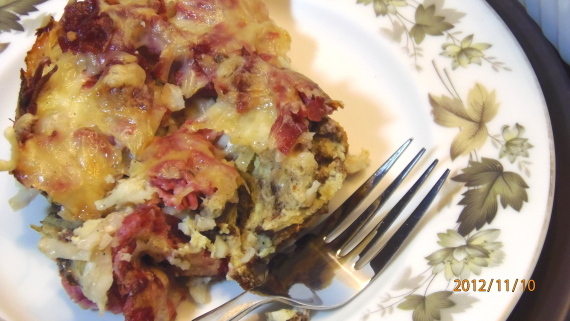 -Bake the strata (covered with aluminum foil) for approximately 40-45 minutes. 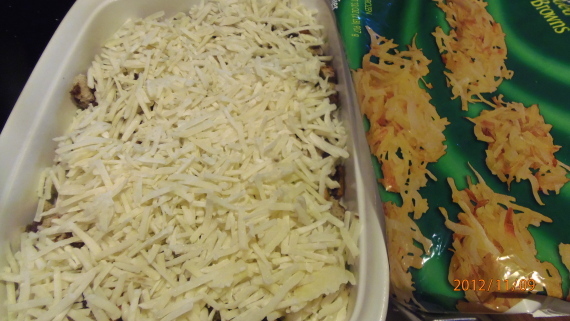 -Uncover and continue baking for an additional 10 minutes or until the cheese is nicely melted and browned. 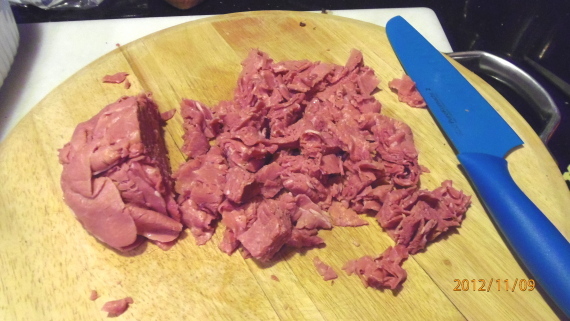 -Allow to sit for approximately 15 minutes (loosely covered) before serving. This would make an wonderful brunch course as well as a tasty dinner menu idea. 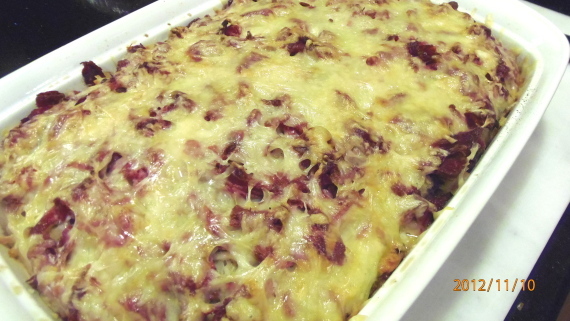 Serve it with a nice lettuce salad and some wonderful veggies and you have a terrific and delicious meal that was quick and easy to prepare and ready to bake whenever you’re ready to serve. 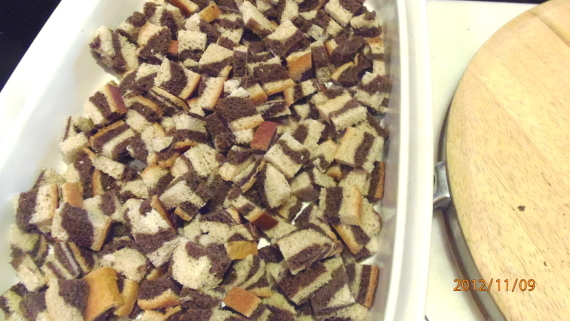 Some other suggestions I might have is to top the strata with some course ground breadcrumbs and maybe a little drizzle of butter before baking. Heck, everything’s better with a drizzle of butter. I only wish I would have thought of that the day I made this. Another add-in I might suggest is some frozen, thawed and dried, chopped spinach in the layering. Mmmmm. That’s my kind of add-in. However, my family is not a fan, so it’s not something I could easily do. If you choose to do that, add a slight dusting of fresh nutmeg to the spinach to really bring out the flavor and make it extra delicious! Ooooh, be still my heart!!! Grab a fork and dig in folks! It’s hot, ready and delicious!! !